Influenza (flu) is always an unpleasant condition, however, the complications of the flu during pregnancy are heightened due to many restrictions on treatments and therapies to ease symptoms and suffering. Aching joints and muscles, usually affecting the limbs and the back. Sneezing, sore throat, and nasal congestion. If a person suffers a combination or all of the above symptoms, they are likely to be unwell for up to a week. Most people who suffer a serious bout of the flu are unable to even leave the house. The immune system is often weakened during pregnancy, making women more susceptible to illness, particularly that of colds, flu, and gastric upsets. As a result, it is likely that symptoms will also be more severe and last longer than the 'average' person would experience. Due to immune suppression, pregnant women are also at a greater risk of developing complications such as pneumonia, which in severe cases can be fatal. Nasal congestion is a common feature in pregnancy since hormonal changes can cause a build up of mucous. When the flu also brings on this problem, the symptoms will be worse in pregnant women who already suffer from congestion. Complications of the flu during pregnancy make it difficult for a pregnant woman to take the regular flu-relief medications that other people would take to ease the symptoms. Although a decongestant medication is favorable for nasal congestion, this medication is not recommended for use during pregnancy, particularly in the first trimester (0-12 weeks). Pregnant women are advised to avoid decongestants because there is no evidence or research to conclude these types of drugs are safe during pregnancy. Decongestants and other similar medications can cause drowsiness and, as medications are passed directly across the placental barrier, the effects of such medications could also be placed on the unborn child. Many health providers advise pregnant women to treat nasal congestion with simple measures such as steam inhalation. The inhalation of steam opens up the nasal passages, allowing the mucous build-up to drain and assists in reducing some of the pressure, which is directly responsible for the nasal discomfort. In addition to steam inhalation, the use of a hot compress held directly over the nasal passage can relieve sinus pressure. Applying 'Vicks' vapor rub to a handkerchief or adding a small amount to the steam-inhalation water will assist in opening up the nasal passages. 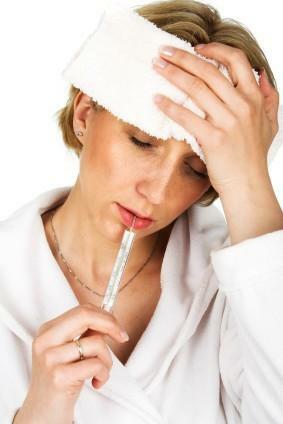 Pain relief and temperature control is also necessary when a person is suffering symptoms of the flu. Once again, the complications of the flu during pregnancy pose problems for pregnant women due to the inability to take appropriate medication to ease symptoms. Acetaminophen and paracetamol are useful drugs and are relatively safe to take during pregnancy, but they should only be taken under the guidance of a physician or pharmacist. Fortunately, these medications relieve both pain and reduce body temperature, so using either will contend with the major symptoms of the flu. Used only when necessary, this drug is not known to be harmful to mother or her unborn child. The use of the flu shot in pregnancy has always been controversial. At this current time, it is deemed safe for pregnant women to receive a flu shot. The "prevention is better than cure" ethic is used in support of this decision. Flu vaccines are manufactured yearly and each year the vaccine is created in response to the previous years flu strains. Because new strains of the flu appear each year, no flu shot is ever 100 percent guaranteed to keep everyone free from all forms of the flu virus. But with so many restrictions on other medicines, the benefit of avoiding some strains of the flu virus is often preferable to being susceptible to all strains. The flu carries a low risk to both the mother and her unborn child, but the risks increase as a result of extended complications of flu, such as dehydration or acquiring secondary problems like pneumonia. Women with pre-existing conditions such as asthma may also be at increased risk and are advised to seek explicit advice from a physician as soon as flu is suspected. There have been minimal links between the flu virus and miscarriage. Although the risk appears low, it cannot be entirely ruled out, particularly in severe cases of the virus. Avoiding contamination of the flu virus is beneficial, particularly to pregnant women. If a woman has a family member or friend who has the virus, she should avoid contact with them until the virus is no longer present. Although this advice cannot be applied to a woman living in the same house as those suffering, early treatment of those with the flu will reduce the time the virus is present in the household.